If you have a budget of 10,000 INR then you have lots of option available with you to get a phone resembling Note 2 at least from outside. Micromax, Karbonn, Spice, Lava and now Byond (an Indian phone manufacturing firm) have created a separate league of such phones. The hardware specifications of this new B65 are almost same and the only drawback I see here is that they are not using Jellybeans and their OS rather ICS (IceCream Sandwich) has been used in all these phones. For the users interested in the Jellybeans they can go for Byond B63 which has Jellybeans and rest of the hardware specifications are almost same in both the phones, only screen-size and front camera are of low spec as compared to this B65. 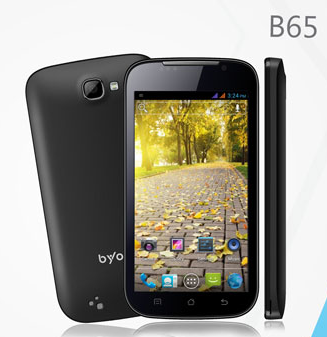 To know more about the specifications of B63 you can click here. Let us take a look at the hardware specification. The screen size is of 5 inches with WVGA display and 5-point multi touch feature. The processor is dual core advanced 1 GHz, don’t have any clue that how this is advanced from the normal processor. It is also powered with the 512MB RAM. It is a dual SIM phone which uses Android 4.0.4 IceCream Sandwich to operate. Now Battery is really good (20% more as compared to the Micromax canvas 2), so you will not have to get worried about the charging problem. Other connectivity support like 3G, Bluetooth and WiFi are available on this phone. The primary or the back camera is of 8MP with single flash and the front camera is of 1.3 MP. The internal capacity for the applications is 4GB out of which 2 GB will be available to you and it can be expanded up to the traditional limit of 32GB. It has been priced at 9200 INR, which is decent but I will suggest you to look for other options and compared their hardware specifications. Now of the phones at this range has specified about the make of the processor used in it, so it is almost impossible to determine that which one is good and moreover be prepared for the certain connectivity issue related to WiFi or 3G, in most of the cases they are hampering the usage of the phone.